Muthuswami Dikshithar, the great Devi Upasaka, has composed 7 krithis on Goodess Mahalakshmi out of which three krithis eulogizes Goddess Varalakshmi. The name “Vara”Lakshmi itself literally means that She is the bestower of boons. These krithis contain several references to Lakshmi Sahasranamam such as “Hiranmayeem”“Hymavatheem”, “Narahari Hrudaya Nivasini” etc. It is said that singing these krithis (or chanting for those who cannot sing) will bring in all fortunes. Dikshitar himself was a great yogi who was unattached to all worldly and materialistic wealth and gives the message through these krithis that worshipping the Supreme Goddess itself is the first fortune which in turn brings unsurpassed amount of wealth in all facets of mortal human life! 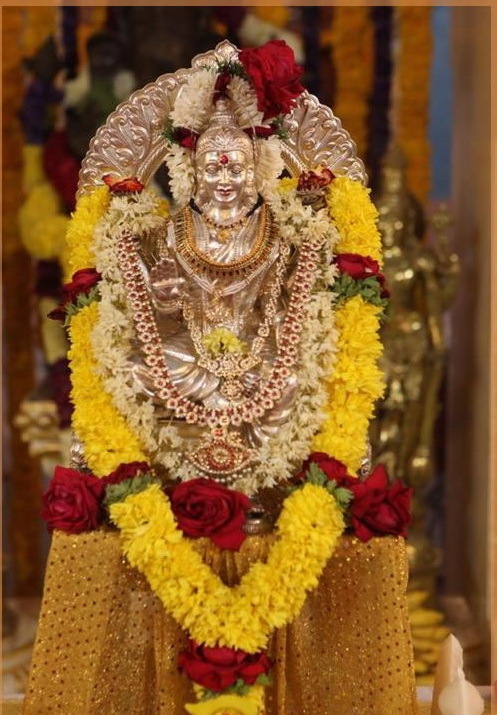 The Mahalakshmi Krithis of Muthuswami Dikshitar are uploaded. Also added the Kanaka Dhaara Sthotram of Sri. Adi Sankara Bhagavathpada as the crowning jewel, sung by the legendary Musician M.S.Amma as the last track. The power of her beautiful glance yields unsurpassable amount of wealth of all kinds. Let us place Her as the most precious Jewel in the lotus of our Heart to always guard and protect us.. Wish you and all your family members a very auspicious Varalakshmi Vratham as well. lovely message and the great effort of yours to give this today.Bless you Anu.